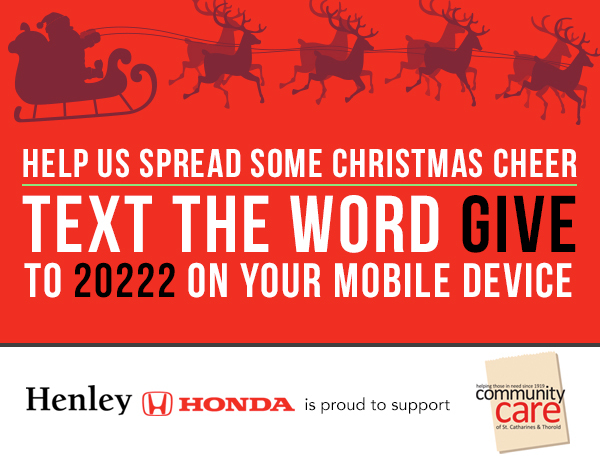 The season of giving is upon us once again, and Henley Honda is proud to be supporting community care this year with #GiveALittleGetALot. We’re making it easier than ever for you to donate and make a difference this holiday season. All you have to do to donate is text the word ‘GIVE’ to 20222 on your mobile device. You will be prompted for an amount, ($5, $10, $15, $20 or $25) and within seconds you will have helped to make a difference to a family or someone in need in your community this holiday season. For this year, Community Care has also prepared a video that shows how easy it is to donate, and how much of a difference you can make in your community with just one small donation. Community care has been in operation since 1919. Their mission is to compassionately provide vital services and assistance to individuals and families that meet their basic needs and help bridge their journey to self sufficiency. Community Care programs range from food and shelter security to emergency services and supports that lead to the independence clients strive to achieve. Best of all, the money that you help raise for Community Care stays right here in St. Catharines and Thorold! You may also donate food items, clothing and small household goods to Community Care this holiday season as they are in great demand as always.We have set up a food donation bin at our dealership, so feel free to stop by anytime to help add to it!